My name is Angela Mansell and welcome to the very best in personal driving tuition across Clonmel and surrounding areas. Abbey School of Motoring is one of the most popular and reliable driving schools for high quality driving tuition. My driving school is based on the belief that my customers needs are of the utmost importance and I am committed to meeting those needs. As a result of this a high percentage of my buisness is from customer referrals and I would welcome the opportunity to earn your trust and to deliver you the best service in the industry. My driving school has been in operation since 1992. I have achieved an exceptionally high standard of test results with the Road Safety Authority. I have certificates from the Irish School of Advanced Driving Instructors and also the Irish School of Motoring SKID School. 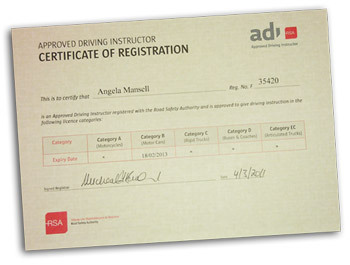 I am a qualified RSA registered instructor. During this time I have built up an excellent reputation for patience and understanding and my above average pass rate.